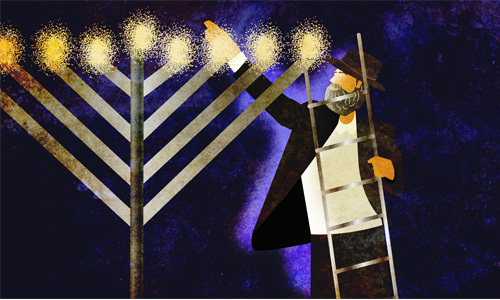 Why Insist on Depicting a Straight-Branched Menorah? Despite a number of ancient depictions of the Temple menorah with rounded branches, most notably on the Arch of Titus, Chabad makes a point of depicting the menorah with straight, diagonal branches. What is this based on and why the insistence that it be depicted that way? In short, the Rebbe—Rabbi Menachem M. Schneersohn, of righteous memory—insisted on straight branches not despite these depictions, but precisely because of them. But let’s start at the beginning. Most read Rashi as stressing that the branches of the menorah were diagonally straight, and negating that they were rounded like an arch. There are two 17th-century rabbis, Rabbi Yosef Shalit ben Eliezer Riqueti in Chochmat haMishkan3 and Rabbi Emmanuel Ricci in Ma'aseh Choshev4 (more famous for his kabbalistic work Mishnat Chassidim), who describe the branches of the menorah as being rounded. They both write that although their descriptions differ from Rashi’s, they chose to do so by virtue of the fact that Maimonides (as well as the simple reading of the Talmud) omits the word b'alachson (diagonal) when describing the branches, apparently implying that he thought them to be round. This nuance is highly relevant, as we shall see. However, as Rabbi Abraham Abele points out, this opinion contradicts the accepted, authoritative view of the Mishnah and Talmud that the branches of the menorah were aligned.8 As such, this third (and mostly rejected) opinion does not have much bearing on the general straight-vs.-rounded-branch debate discussed here. While Maimonides does not describe the shape of the branches in his Mishneh Torah, he does address the topic in a rare manuscript of his “Commentary to the Mishnah,”9 in which he hand-draws the design of the menorah. In this drawing, the branches are depicted as straight lines from the stem to the full height of the menorah. In light of this, the Rebbe points out that there is really no earlier source than Rabbi Ricci and Rabbi Riqueti that describes the branches of the menorah as rounded. 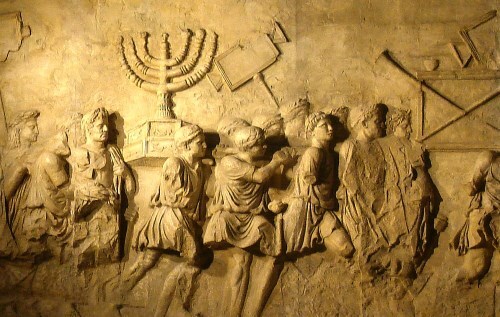 Let’s return to your question about the Arch of Titus and other archaeological findings that depict a rounded menorah. The Arch of Titus was constructed in the year 81 by the Emperor Domitian shortly after the death of his older brother Titus to commemorate Titus' victories, including the siege and plunder of Jerusalem just a few years earlier. The sculptural art inside the arch includes two panel reliefs commemorating the joint triumph celebrated by Titus and his father Vespasian. On one of the reliefs is the scene depicting the triumphal procession with the booty from the Temple in Jerusalem, including the sacred menorah. The Arch became a symbol of the Jewish exile, and eventually Pope Paul IV made it the place of a yearly oath of submission of the Jews. The menorah in the arch is depicted with circular branches. And it is based on this image that countless images of the menorah over the last 2,000 years have been circular, including the menorah symbol of modern-day Israel. So if we are to claim that the branches of the menorah were indeed straight, then why would the Arch of Titus, which was built just a few years after the destruction and depicts the plunder of Jerusalem, depict the branches in a rounded fashion? The Rebbe offers a number of possible explanations. Firstly, it should be noted that the design on the arch is not an exact replica of the menorah and is an artistic interpretation. For one, the Temple menorah had feet extending from its base, and the menorah on the Arch of Titus has no feet. Additionally, on the menorah’s shaft is the form of a sea dragon, one of the false dei­ties worshiped by the Romans and something that was certainly not on the Temple menorah. Accordingly, it cannot be relied on as an accurate source regarding the design of the menorah, particularly in regard to points where it contradicts the views of leading Torah authorities. Secondly, in addition to “the” official Temple menorah, there were ten candelabras built by King Solomon. And although improbable, it is possible that these other menorahs were rounded. If this were to be the case, then both would be accurate— Rashi and Maimonides would be referring to the original menorah made by Moses, and the Arch of Titus would be depicting one of these other menorahs that was plundered by the Romans during the destruction of the Temple. We can now appreciate the Rebbe’s stance on the depiction of the menorah. The sages of the Talmud state that the menorah was a “testimony to all the inhabitants of the world that the Divine Presence rests within Israel.”13 This was due to a number of things, including the fact that the miraculous western lamp of the menorah was never extinguished. Thus, the menorah is a symbol of the connection between G‑d and His nation Israel. It is for this reason that the Rebbe was so insistent that the menorah not be depicted to resemble that of the Arch of Titus. For even if that were indeed a representation of one of Solomon’s menorahs, it is still not the ideal menorah. Therefore, any depiction made now with a rounded menorah is essentially based on the image on the Arch of Titus. So rather than represent our closeness to G‑d, the rounded menorah symbolizes the very opposite—the exile of the Jews and the destruction of the Holy Temple at the hands of the Roman conquerors! This year, may we merit to light the Chanukah menorah in the Holy Temple! Much of this article is based on Likutei Sichot, vol. 21, p. 168. Cited in Maaseh Choshev, ch. 7. Presumably, this is a reference to the Sifri Zuta quoted in Yalkut Shemoni at the beginning of Parshat Behaalotecha (remez 719). See his “long” commentary to Exodus 27:21 and “short” commentary to Exodus 25:37. See Zayit Ranan on Yalkut Shemoni toward beginning of Parshat Behaalotecha (remez 719). This piece seems to have been omitted in some editions, which have a shortened version of his commentary, but you can see it here in the edition printed in Venice in the year 1743. For more on all this, see Meluim to Torat Shleimah, vol. 22, p. 32, and Likutei Sichot, vol. 21, p. 169, fn. 43, and gloss ad loc. For more on this, see Eli Brackman, “Maimonides' View on the Shape of the Branches of the Menorah According to Oxford's Rare Manuscript,” (December 5, 2013). Much of what he writes overlaps with this article, as it is likewise based on the Rebbe’s writing in Likutei Sichot, vol. 21, p. 168. Likutei Sichot, vol. 21, p. 168-169. Is It OK to Wear a Mezuzah Necklace? Why Do We Face East When Praying? Or Do We? Why Say L’Dovid Hashem Ori (Psalm 27) During the Month of Elul? Why Do Jews Cut Their Fingernails Out of Order? Why (and When to) Give Charity Before Prayer? Did the menorah have circular or straight branches? In my previous comment to the scholarly "why insist on straight-branch [Temple] menorah" by R. Yehudah Shurpin, I give more credence to the accuracy of the Menorah depicted in the Arc of Titus than to the "straight branch menorah" he insists on. I agree however, with Yehudah Shurpin that the hexagonal base depicted in both the Arc and the Emblem of the State of Israel is totally off-base (pun intended). The Talmud specifically states that the Menorah stood on legs. I theorize that the hexagonal base was added when the Romans decided to parade the Menorah on their shoulders. They may have said "Menorah will be too wobbly and uncomfortable to carry as-is on our shoulders through this whole long parade". It is hard to be constantly reminded of the same historical evil regarding the inquisition, as if to point a finger again and again, after all my family survived the holocaust because hidden by Pope Pio XII. And Pope Jean Paul asked for forgiveness. So if forgiveness is issued then it is against Torah to keep pointing fingers at those who asked. So why keep calling evil what has changed? "Yotzeem" means traveling horizontally. "Oleem" means moving upward. "Yordeem" means moving downward. The branches are described as "yotzeem" from the Menorah. I would translate that as "extending from the Menorah". If asked to draw a picture, my diagram would show a very short line moving horizontally out of a vertical base (representing the beginning of a horizontal Menorah-branch beginning to extend out of a vertical Menorah-trunk). This, to me, would be a strict adherence to the plain meaning of biblical text. In a comment by Rashi, in my Chumash, the flames of the six branches illuminate the center. The only way that this can accurately occur is if the six outer lights are arranged as a parabola. The description of the Antigone coin seems to match this idea. This does not verify that either the curved or straight design of the menorah is correct. However, the image here showing two of the outer branches lower than the central candle may be somewhat of what I am thinking, that the shape of the menorah is actually opposite to what we know. More, please Thank you. But what of the knobs and such? And isn't it supposed to be a monolithic if complex olive oil-fueled lamp rather than candle-stand? Yet the latter is often how it is translated and implemented. Why insist on a Menorah with straight diagonel branches? Archaeologists unearthed a coin from the short reign of the Jewish King and Kohen Gadol , Antigone. This predates the destruction of the Second Temple. The Antigone coin is stamped with the Menorah image. 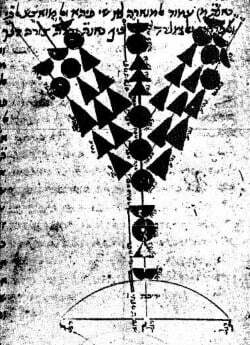 It is a very simple and rudimentary image but the branches are much more rounded and like the Titus Menorah than like Maimonadies' menorah-monstrosity. The Maimo branches are different heights. Not all rabbinic scholars can draw. The coin-menorah basically matches the Titus branches it is unlike the Titus Menorah in that it has legs at the base. This is in agreement with the Talmud which describes the Menorah as having legs. Hmmm... Very Questionable 1. In that picture where the Rambam sketches the menorah, he says in that picture that this is a rough sketch. Rav Kapach Z''L who had the best mesora from the Rambam and was considered the biggest scholar on the Rambam of last generation also notes how this is a rough sketch and it's easier to draw things straight. 2. Among the ancient drawings of menorahs with rounded branches that appear is one from the Herodian Mansions beneath the Wohl Torah Center in the Jewish Quarter of the Old City, a drawing of a menorah in a catacomb of Beit She'arim, the burial place of Mishna compiler Rabbi Judah Hanasi, and others.